Here’s a travel hack for you: Make the most out of your long weekend and go destination-hopping! Visiting multiple destinations in one go doesn’t only let you experience as many places as possible — it’s also more affordable than if you’d travel to these places on different times. If you’re thinking of going destination-hopping for the first time, start with these seven weekend destinations in the Philippines. If you’re not a fan of flying but want to explore the far depths of the Philippines, then go on a Northern adventure. 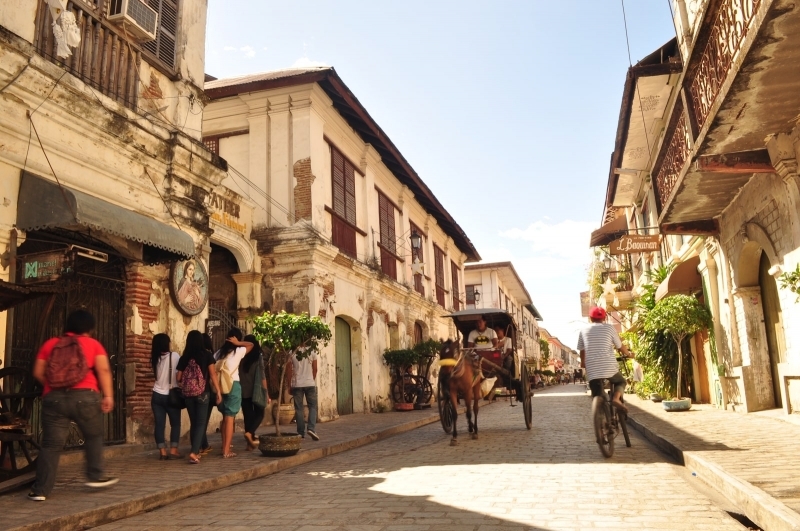 Vigan, Laoag, and Pagudpud are all but a road trip away.Aside from mouthwatering garlic longganisa, okoy, and empanada, Vigan is also widely known for its well-preserved Spanish streets. Most famous among these is Calle Crisologo, now still paved with stone and lined with ancient Spanish houses.While Vigan oozes historic charm, it’s still a city full of life. Along its cobbled streets, you’ll find souvenir shops, Filipino restaurants, and antique stores. At night, there’s also a free fountain show at the centre of the city. How to get there: From the Partas terminal in Cubao, ride a bus bound for Vigan City. Farther north, you’ll find the capital city of Ilocos Norte — Laoag. Nicknamed ‘The Sunshine City,’ Laoag seldom brings rain any time of the year. Home to the Laoag International Airport, Laoag is considered by many as the gateway to the North. As the city is a 10-hour drive away from Manila, many travellers opt to fly in. Among the many landmarks of Laoag is the Sinking Bell Tower, with a name that denotes its distinct character — the tower sinks an inch lower every year. Laoag is also known for its sand dunes, and adrenaline junkies flock to the area for adventure sports including sandboarding and ATV and 4×4 rough riding. But of course, Laoag is best known for its old churches, among these are the Paoay Church and the Laoag Cathedral. How to get there: From Vigan, ride a bus bound for Laoag City. To cap off your Northern adventure, kick back and relax in Pagudpud. Unlike other travel destinations in the Philippines, this far-flung municipality doesn’t have many tourists. This said, Pagudpud doesn’t fall short of spectacular. It’s lined with lush hills and mountains, rice paddies, and pristine shores. Tricycle tours are available around the municipality. These will bring you to Kabigan Falls, the Burgos Lighthouse, Bangui windmills, Bantay Abot Cave and Kapurpurawan Rock Formations. Aside from these tourist spots, you can also visit the stunning Saud Beach — its fine white sand and crystal clear waters will surely make your road trip worth it. How to get there: From Laoag, ride a bus bound for Pagudpud. Broken-hearted or not, you’ll find the Cordilleras breathtaking. It’s not only a place to cool off, it’s also a destination full of cultural wonders. ‘The City of Pines’ is not new to the list of weekend getaways in the Philippines for a reason. Anyone looking for a short break from the heat of Manila can easily access Baguio. Relish in the cool weather with a cup of hot chocolate, and then shop til you drop in the many outlet stores in Camp John Hay (or in the thrift stores along Session Road!). Don’t forget to drop by BenCab Museum — the highland exhibits will feed your artistic soul. How to get there: From the Victory Liner terminal in Cubao, ride a bus bound for Baguio. Away from the hustle and bustle of Baguio City, Sagada is a breath of fresh air — literally. With its high altitude, travellers can expect an even cooler climate in Sagada. During your visit, take an icy shower in Bokong Falls. Pay a visit to the hanging coffins. The next morning, rise early and witness the magnificent sunrise at Kiltepan. How to get there: From Dangwa Station, ride the GL Trans bus bound for Sagada. Home of the famous rice terraces, Banaue showcases the ingenuity of Ifugaos. Not only will you witness the grand panorama of the mountain carvings, you will also catch a glimpse of Cordilleran culture. Make sure to interact with the locals, visit museums, and buy locally-made souvenirs. Banaue is generous with natural wonders. Aside from the mountains, the Tappiya Falls is also a sight to behold. How to get there: From the Sagada Municipal Hall, take a jeepney bound for Bontoc and get off at the Bontoc Municipal Hall. Then, take a bus bound for Banaue. If you’re looking for a rather short but spontaneous getaway, you need not travel far. There are several noteworthy weekend getaways in and near Manila. For us who don’t live in Manila, a trip to the capital city is as good as a short travel. Frolic along the newly-cleaned Manila Bay before heading to the biggest mall in the Philippines — SM Mall of Asia. Just behind this mall, you’ll find the ferry service that will bring you to Bataan. Offering a stark contrast against the modernity of Manila, Bataan is adorned with historical and cultural landmarks. 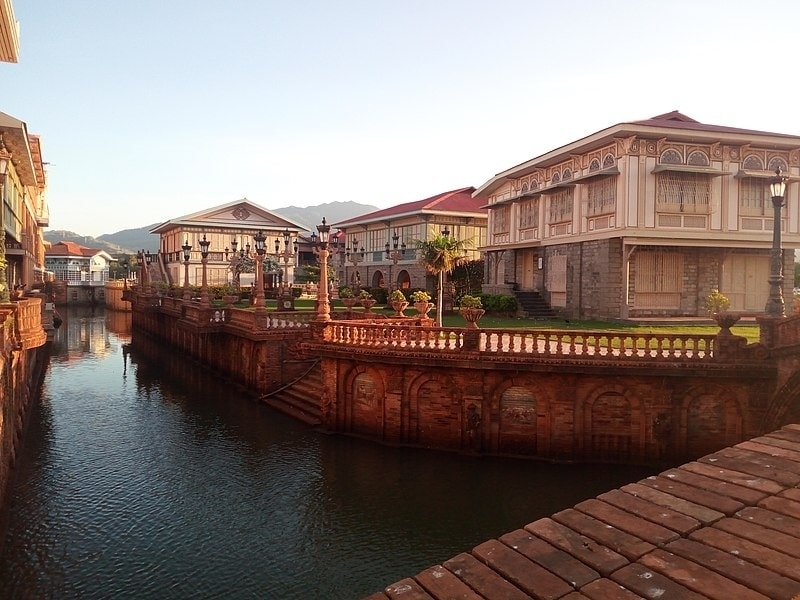 To prove this, let Las Casas Filipinas de Acuzar tour you around their heritage community reminiscent of old Manila. Aside from being a heritage wonderland, Bataan is also home to our endangered sea turtles. At the Pawikan Conservation Centre in Morong, these marine creatures are protected and nurtured. How to get there: From the Esplanade Seaside Terminal, take the Manila-Bataan ferry service that will transport you to the province in less than an hour. After your historical tour in Bataan, seek nature’s refuge in Zambales. Lined with sandy beaches and coral reefs, the province has several stunning beach spots and pristine islands. 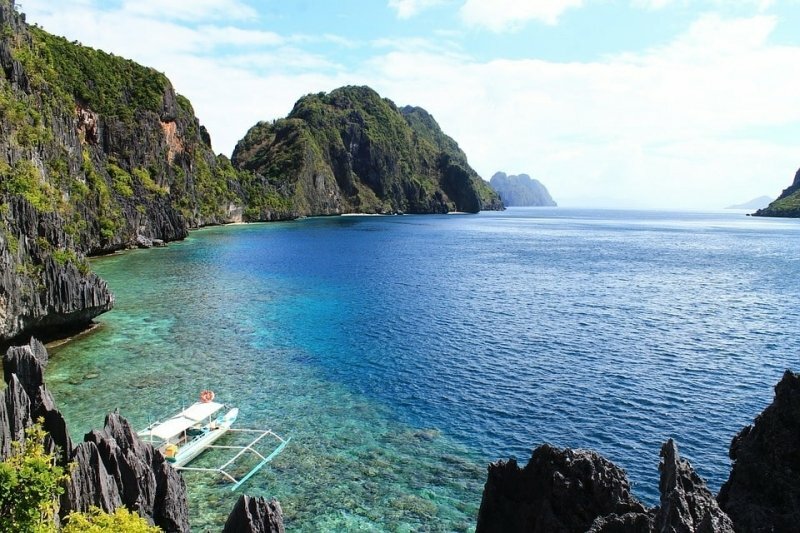 Among them are the famous Nagsasa Cove and Anawangin Cove. How to get there: From the Victory Liner terminal in Balanga City, take the bus bound for Olongapo City, Zambales. Destination-hopping may sound too rushed for some people, but not if you’re travelling to the East. The following destinations are the epitome of peace and quiet. The surfing beach in Baler has drawn numerous tourists to it to catch some gnarly waves. Unlike the town’s waves, however, Baler itself is a peaceful haven for travellers seeking to slow down. While you’re in the area, might as well take a dip in the icy pool of the Mother Falls and pay a visit to the Balete tree — the biggest one in Asia. How to get there: From the Genesis or JoyBus terminal, ride a bus bound for Baler. There’s more to Nueva Ecija than just rice paddies. A hidden gem in General Tinio, the Minalungao National Park boasts of river, falls, cave, and cliff. The park isn’t only a paradise for nature lovers, it is also a retreat for adventure seekers. Think: cave hopping, river rafting, cliff diving, and riding a zip line. Every adventure is easily accessible in this national park. How to get there: From the bus and van terminal in the public market, ride any bus or van bound for Cabanatuan City, Nueva Ecija. 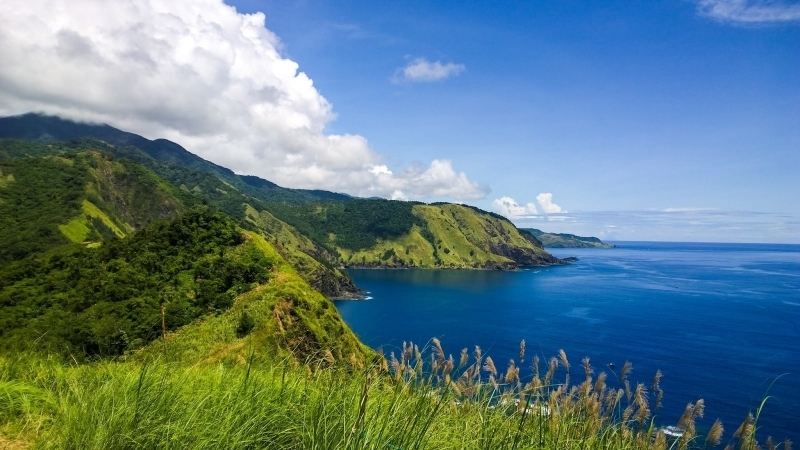 Rolling hills, high winds, and deep blue waters don’t only exist in Batanes — they also do in Dingalan. The town has a protected national park ideal for hiking, a towering lighthouse you can trek, and a pristine white beach open for people who just want to get some sun. The town also has five waterfalls and an enchanting cave, all of which add up to the interesting character of this beautiful town in Aurora. How to get there: From the Cabanatuan Central Terminal, ride a bus bound for Dingalan. Looking for a natural escape? Let this route take you to paradise. Tarsiers and the Chocolate Hills are fascinating enough to draw travellers from all over the world to Bohol. Besides these, the province also boasts of a verdant man-made mahogany forest, a thrilling ecotourism park, serene beaches and sparkling waterfalls. How to get there: From NAIA, fly in to Tagbilaran City. Island hopping in El Nido is a dream. Tranquil waters and fine white sand surround each island, and colourful marine life swim underwater. Travellers can make the most out of El Nido as they free dive, snorkel, swim, kayak, or camp out. How to get there: From the Bohol-Panglao International Airport, fly to El Nido via AirSWIFT. Like El Nido, Coron has an abundance of stunning beaches. The difference is, more tourists flock to the former as it’s a lot bigger and currently more commercialised than Coron. It’s the peace and serenity in Coron that makes it the ideal retreat — perfectly wrapping up the fun and adventure of your weekend getaway. Also, don’t leave Coron without trying out the rare saltwater hot spring. How to get there: From El Nido, take the Bunso Boat to Coron. 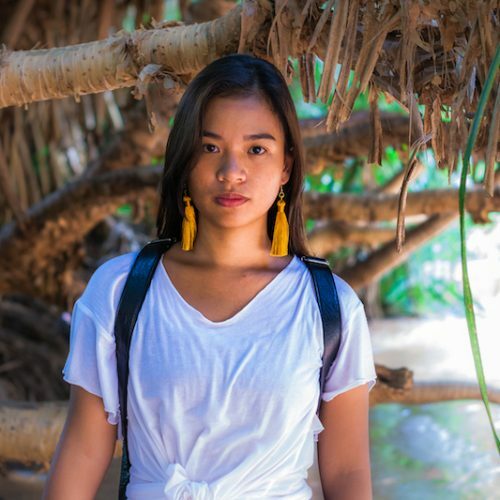 Diversify your knowledge of Philippine culture and go on a Visayan adventure. These three islands will show you the exquisite qualities of Visayas. Among the most powerful provinces during the Spanish colonial times, Iloilo has numerous ancient churches gracing old world architecture including the Miag-ao Church, the Molo Church, and the San Jose Church. Aside from these churches, Iloilo is also home to Islas de Gigantes — an island group famous for its caves, beaches, and lagoons. How to get there: From NAIA, fly in to Iloilo City. Exhibiting quite a historic charm, Balay Negrense and Ruins of Talisay are tourist spots in Bacolod you can’t miss. Besides these, there are ancient churches around the province that add up to the beauty of Bacolod. Of course, you can’t miss eating chicken inasal when in Bacolod — you’ll find this famous grilled chicken almost anywhere in the province. How to get there: From the Iloilo River Wharf, take the fastcraft ferry to Bacolod. Once a part of Iloilo, Guimaras is just a stone’s throw away from the province. In fact, Guimaras offers a vantage view for travellers to witness the full scenery of Iloilo. Hailed as the ‘Mango Capital of the Philippines,’ Guimaras will satisfy your sweet tooth with its yellow fruit. After having a taste of Guimaras mangoes, you can also travel to the province’s many beaches and waterfalls. How to get there: From Pulupandan Wharf in Bacolod, take the pump boat to San Lorenzo, Guimaras. Of course, the Southern islands of the Philippines are otherworldly, too. Visit these enchanting destinations for your next weekend getaway. Fit for royalty, Davao is a province of superlatives. It’s the home of Mount Apo — the highest peak in the country, the durian — also known as the ‘king fruit’, and the haribon — a bird so majestic its name is a portmanteau of the words hari (king) and ibon (bird). Davao doesn’t only boasts about its highlands, as its waters are also rich with beauty and life. This said, you can enjoy both its pristine beaches as well as its impeccable seafood. 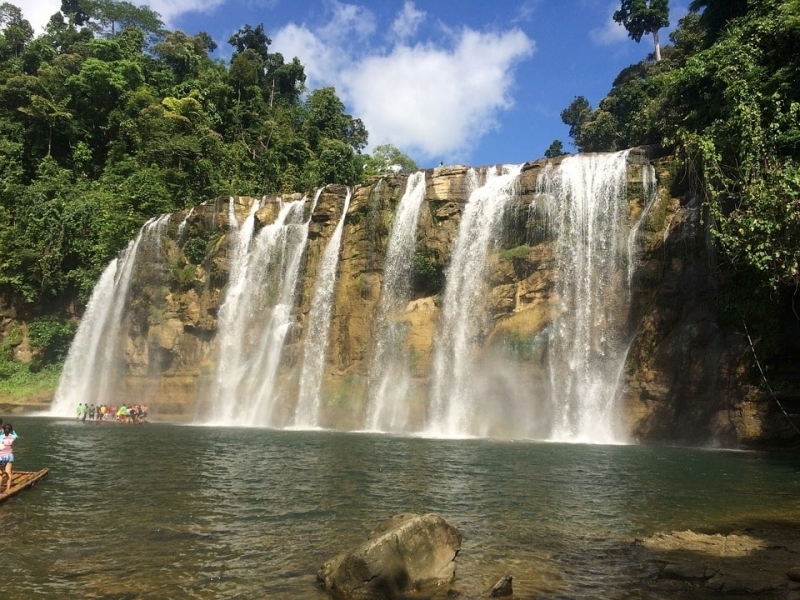 Surigao City, the capital city of Surigao del Norte, is often brushed off as a mere jumpoff point to the more famous Siargao Island. But, the city has its own hidden gems travellers must see. For example: The Mabua Pebble Beach is a unique beauty, with pebbles of different sizes lining the shore. Another example: The Day-asan Floating Village, also known as Little Venice, is a fishing village where visitors can witness the farming of fish, crabs and lobsters. How to get there: From the Ecoland Bus Terminal in Davao, ride a bus bound for Surigao City. This surfing capital boomed in the last years, and there’s an obvious reason why: its coconut trees and world-class waves make it seem like an idyllic tropical paradise. Travel to the island, and you’ll find out that it truly is. Travellers can surf, swim, or just lounge around in Siargao’s many beaches. At night, you can join the tropical parties in General Luna, too. How to get there: From the Surigao Port, ride a ferry bound for Siargao. With the numerous islands in the Philippines, it will take forever for anyone to travel to each destination. Start ticking off your local bucket list with multiple destinations per vacation, and you’ll see most of the country in no time.